colors.rgb("blue") yields "#0000FF". colors.rgb("yellowish blue") yields NaN. colors.sort() yields "rainbow"
Using the rules set out in the image and its title text (quoted here), create a program that accepts all the given input and displays the appropriate output. Input can be taken with stdin or nearest equivalent. 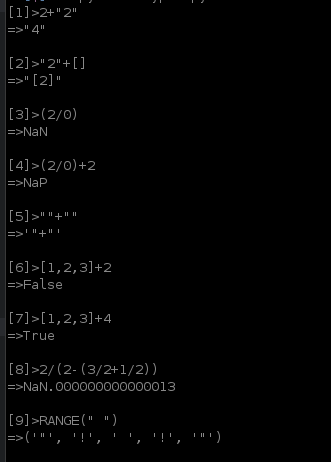 There should be a line like [n]> on which to type it, and n increases by 1 each command. It should start at 1. The result should be displayed using stdout or nearest equivalent. There should be a => on each line of output. All 13 conditions, plus the 3 in the title (quoted) must work. This is code golf, so shortest answer wins. Some of the conditions are generalized and others will only work with exact input. (A/0)+B will work with any A or B. literal_eval (E) raises an error. [A, B, C]+D works by checking that D == C+1 so will work for any length of list and any numbers. 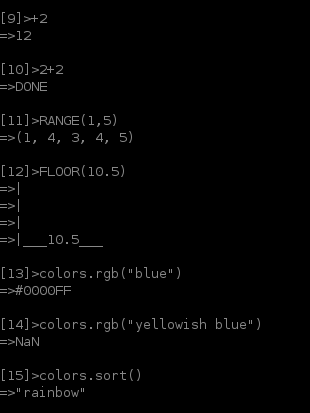 +A will work for any A. Ouputs "current_line_number+A"
FLOOR(A) works for any A.
colors.rgb("blue") The lstrip in eval turns this in gb("blue") which has a hardcoded response. colors.sort() The lstrip turns this into t() which has a hardcoded response. Brainsteel pointed out an error in my assumption for rule 10. Operator overloading isn't evil, right?? My goal wasn't as much winning (obviously) as it is making it as generic as possible. Very little is hardcoded. Try stuff like RANGE(10), 9*1, and RANGE("A"), (2/0)+14, and "123" for fun results! ryan@DevPC-LX:~/golf/xktp$ python xktp.py # oops again and again! Everything is hardcoded, but the input is turned into a number that is then converted to a string and looked up in a large string that contains all these numbers followed by their answers. Since there was no mention of absolute hardcoding here's my solution. Generate a hexdump of a file!